With Final Four games just around the corner, we’ve done our part and collected snapshots of some of the hottest hunks in the UAAP this season. You’re welcome! Jeron Teng looks dapper in this sleek black suit. We wonder, how would it feel like if he showed up at our doorstep dressed like this? We're so used to Kiefer Ravena dressed up in his blue and white jersey, so we loved seeing him fit his off-white suit for an upcoming event. Triple the fun: Gwyne Capacio, Nico Elorde, and Von Pessumal snap a quick selfie while waiting for their flight. Ateneo's big man Kris Porter shares his photo with Ateneo Women's Volleyball Coach Tai Bundit. Is it just us, or does Kris look A LOT like Tom Cruise? Hey Mikee Reyes, we're giving you two thumbs up, too. University of Santo Tomas star Kim Lo poses with his furry friend. HOW ADORBS IS THIS? When Thomas Torres smiles, the whole world stops and stares for a while. Far Eastern University hardcourt hearthrob Mac Belo snaps a photo with Gretchen Fullido. 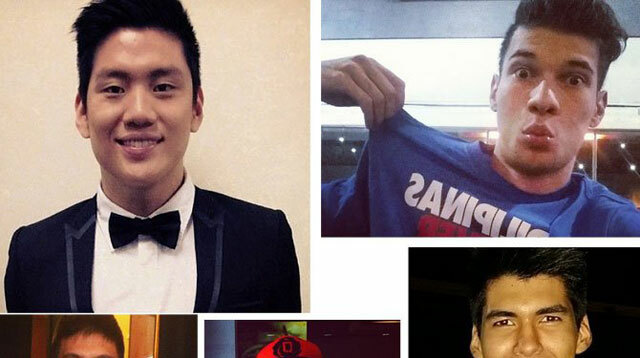 We can't tell which one we love more: Arnold Van Opstal's support for Gilas or his super kissable puckers! FEU superstars Mac Belo and Mike Tolomia in one photo? Kilig!